Welcome to Kristy Ellis Personal Training. 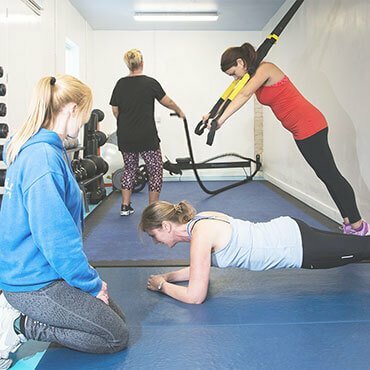 We’re a small, friendly group of all-female personal trainers and our aim is to help you achieve your health and fitness goals. We have two sites you can train at: our original studio in central Nottingham and our new studio in Chelmsford, Essex. Our trainers run both small group personal training and individual personal training sessions. They can help you focus on your specific exercise and nutrition needs, whether you are looking to lose weight, get fit or just lead a healthier life. We aren't like a typical gym; just take a look at our testimonials, and contact us today for your free consultation! Our original studio in the East Midlands. Located in central Nottingham. Invest in your health, see how much training with us could cost. Our second studio in the heart of Essex. Fully equipped to make training fun! Questions? Concerns? Start here for all the common queries. I can wear some of my old favourite clothes! When I started training with you guys I couldn't do any exercise; I couldn't walk up a hill without being absolutely exhausted! After over a month of sessions three times a week I can see big improvements in my general fitness and my body- I can wear some of my old favourite clothes! I am really grateful for all the support and MOTIVATION. I would not be where I am now without it! I have thoroughly enjoyed my first few weeks' training and am extremely happy with my progress. I feel like I have so much more energy and determination than I ever have before. All of the trainers are very supportive and I look forward to continuing my weight loss and fitness journey with them. Since I started training over a month ago I feel stronger and healthier. Since I started training over a month ago I feel stronger and healthier. The encouragement that I've received from the trainers has really helped my self confidence and I feel as though the only way is up from now on. I've come to realise how important it is to take time out to exercise and look after yourself and now I look forward to reaching my goals! I have a lot more energy since starting the programme. I feel the 28-Day Accelerator Programme has helped me so much and has given my confidence a boost. The sessions are really fun whilst still challenging, which is great. I feel a lot fitter and healthier, and find I have a lot more energy since starting the programme. Thank you to all staff that have helped me with my training. When I first joined I didn't know if it would be right for me but it's definitely working. I really enjoy coming and am pleased with my results so far. I joined because I am going to Jamaica but am definitely gonna keep it up when I get back. It is hard work but I feel so much better about myself and I couldn't do it on my own, thank you all! Experienced friendly, courteous and committed, one of the best. I wouldn’t hesitate to recommend her to anyone wanting to improve their training and general fitness.